Jerusalem (AFP) - German Chancellor Angela Merkel and Israeli Prime Minister Benjamin Netanyahu pledged Thursday to stop Iran from obtaining nuclear weapons but disagreed on how as they met to showcase cooperation between their countries. The one-day visit to Israel by Merkel and members of her cabinet was part of German-Israeli government consultations held regularly, but came after Netanyahu's harsh criticism of European countries over their efforts to keep alive the Iran nuclear deal. Germany and other European countries have also repeatedly hit out at Israeli settlement building in the occupied West Bank and warned over threats to remaining prospects for a two-state solution to the conflict with the Palestinians. The two leaders brushed aside their list of differences and talked up ties between their countries, while Merkel stressed Germany's "everlasting responsibility" to oppose anti-Semitism. Merkel also sought to smooth over their disagreement on the nuclear deal that Netanyahu brands a "historic mistake". "We are very firmly of one opinion with Israel .... that everything must be done to prevent Iran from obtaining nuclear arms," Merkel said during a news conference with Netanyahu. "Where we do not see eye-to-eye is the way there. That's why the discussions here will go on." Netanyahu has urged European nations to follow the lead of US President Donald Trump and withdraw from the accord with Israel's major enemy. He faults the deal's limited timeframe and the lifting of sanctions that, according to Netanyahu, provided Iran with cash to finance "a war machine". Netanyahu spoke of his speech at the United Nations last week when he accused Iran of harbouring a secret nuclear warehouse. Iran rejected his claims as a "show". "They're still trying to hide," Netanyahu said. "I exposed some of that in the UN. They're trying to get there through the backdoor." Merkel noted Iran's presence in neighbouring Syria and said it was exacerbating the threat from Israel's foe. She said she had spoken to Russian President Vladimir Putin about reducing Iran's presence in Syria as much as possible. 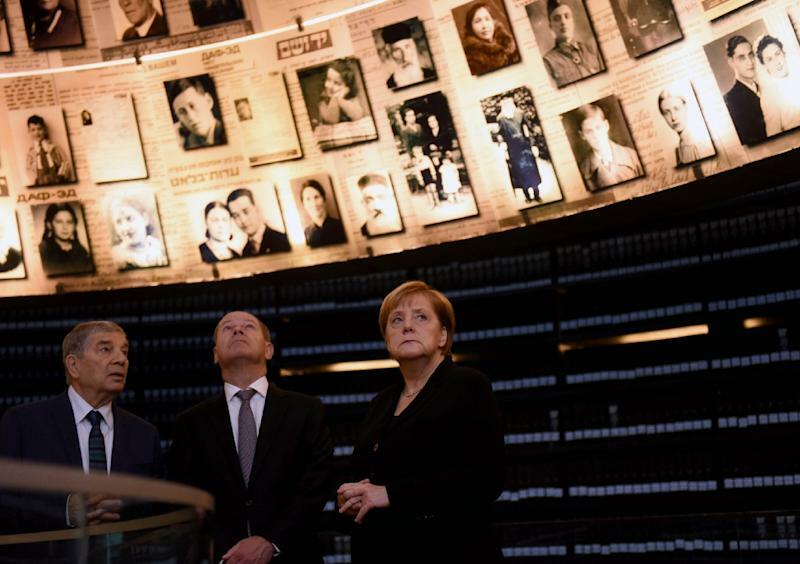 Merkel began the day with a visit to Israel's Holocaust memorial in the hills above Jerusalem. 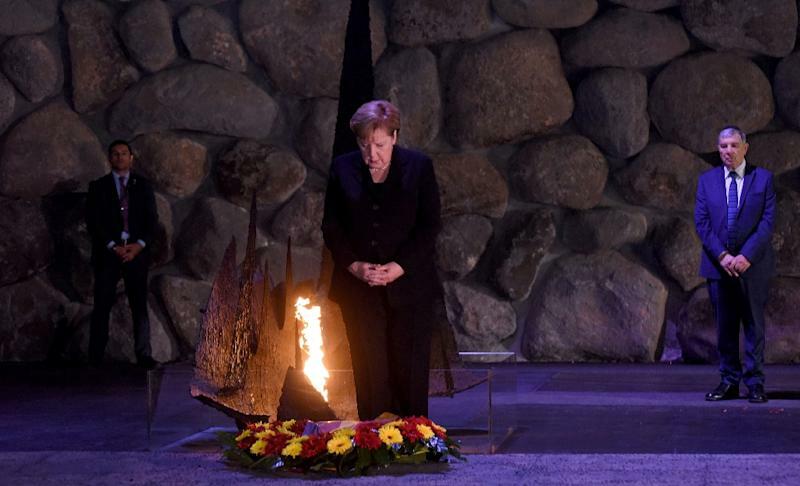 After laying a wreath in the Yad Vashem memorial's solemn Hall of Remembrance, where an eternal flame burns, she spoke of Germany's responsibility as the Holocaust's perpetrator. 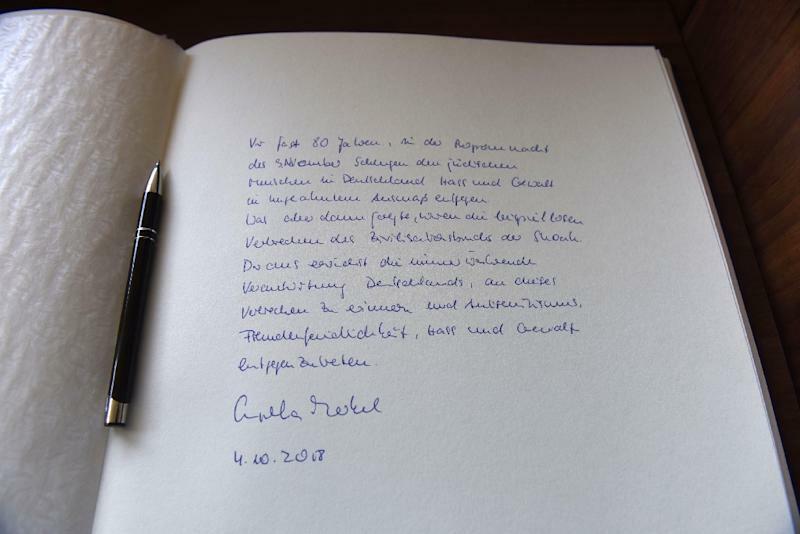 "From this comes the everlasting responsibility of Germany to remember this crime and to oppose anti-Semitism, xenophobia, hatred and violence," she said, reading the message she wrote in the memorial's guest book. The two leaders seemed determined to have the visit run smoothly, greeting each other warmly after Merkel's arrival Wednesday night and touring an innovation exhibit together Thursday. Germany said the joint government meeting Thursday afternoon was focused on economic ties, innovation and technology, while noting the consultations have been in place for 10 years. Felix Klein, who heads the German government's fight against anti-Semitism, was part of the delegation. Fears over a resurgence in anti-Semitism in Germany were also a topic for discussion. Netanyahu's criticism of Europe related to Iran has been especially strong, and last week at the UN General Assembly he accused EU nations of "appeasement". At the same time, Germany has remained steadfast in its support for a two-state solution and in recent weeks joined calls against Israel's planned demolition of a Bedouin village located in a strategic area of the occupied West Bank. A group of children from the village held signs that asked for help outside Israeli President Reuven Rivlin's office as the German chancellor left there. Merkel had earlier denied a report that she threatened to cancel the trip if Israel moved ahead with demolition of the village beforehand. At the news conference with Netanyahu, Merkel said she intended to call Palestinian president Mahmud Abbas to discuss the state of the conflict with him. The last joint Germany-Israel government consultations in 2017 were postponed, with scheduling conflicts cited as the official reason. There were reports however that Merkel was unhappy with a law passed then related to Israeli settlement building in the West Bank.